You are here:Home » Blog » Ciclovia and Open Streets » Next New Brunswick Ciclovia – Saturday, June 9th! Open streets are back! 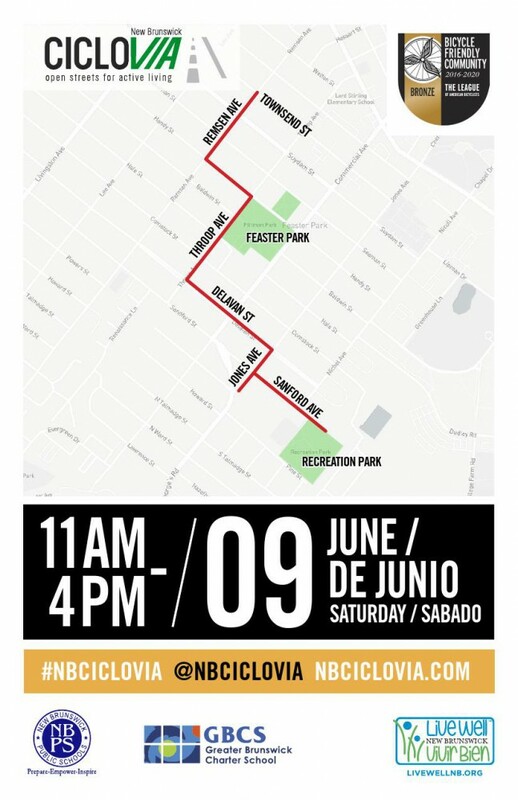 The New Brunswick Ciclovia will be happening this Saturday, June 9th, 2018 from 11AM – 4PM! The new route will start at the corner of Remsen Avenue and Townsend Street and head south towards Feaster Park, ending at Recreation Park along Sanford Avenue/Recreation Park Lane. This event is completely free and open to all! New Brunswick Ciclovia will be closing selected streets to cars and opening them up to the people in order to encourage residents and surrounding citizens to take over the streets while simultaneously engaging the community in healthy active living through biking, walking, skateboarding, or anything else that suits your fancy! This is a wonderful opportunity for the public to explore their diverse neighborhood, engage with their community, and most importantly, have fun. Remember, there is no start or finish line to New Brunswick Ciclovia and it’s not a race! Feel free to join anywhere along the route while enjoying the vehicle free route and having fun all at the same time! Check out photos from previous Ciclovias on our Flickr account.